Gailey, Sarah. American Hippo: River of Teeth, Taste of Marrow and New Stories . Tor 2018. What if: Hippopotamuses were introduced to the lower Mississippi River area in the late 1800s as a source of meat. 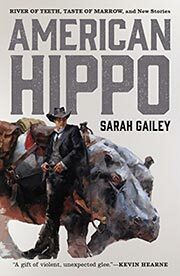 Summary: Stories set in the Louisiana bayous where hippo wranglers contest against feral hippos. 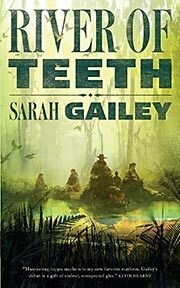 Series note: Collection of the series River of Teeth , Taste of Marrow , "Worth Her Weight in Gold" and "Nine and a Half", all of which q.v. Gaile, Sarah. River of Teeth . Tor 2017. Series note: An American Hippo novella. Published: Included in American Hippo: River of Teeth, Taste of Marrow and New Stories , Tor 2018 (1250176433BUY). Gailey, Sarah. "Worth Her Weight in Gold"
Series note: An American Hippo short story. Published: Posted on Tor.com, Apr. 18, 2018. Published: In American Hippo: River of Teeth, Taste of Marrow and New Stories , Tor 2018 (1250176433BUY). Gailey, Sarah. "Nine and a Half"